The feature everyone has been asking for! 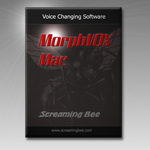 MorphVOX Mac now supports custom sound effects and backgrounds. Add your own sound effects and backgrounds to MorphVOX Mac with this free update to existing owners.